Nipah virus (NiV) is an emerging pathogen that, unlike other priority pathogens identified by WHO, is endemic to Southeast Asia. It is most commonly transmitted through exposure to saliva or excrement from the Pteropus fruit bat, or direct contact with intermediate animal hosts, such as pigs. NiV infection causes severe febrile encephalitic disease and/or respiratory disease; treatment options are limited to supportive care. A number of in-house diagnostic assays for NiV using serological and nucleic acid amplification techniques have been developed for NiV and are used in laboratory settings, including some early multiplex panels for differentiation of NiV infection from other febrile diseases. However, given the often rural and remote nature of NiV outbreak settings, there remains a need for rapid diagnostic tests that can be implemented at the point of care. Additionally, more reliable assays for surveillance of communities and livestock will be vital to achieving a better understanding of the ecology of the fruit bat host and transmission risk to other intermediate hosts, enabling implementation of a ‘One Health’ approach to outbreak prevention and the management of this zoonotic disease. An improved understanding of NiV viral diversity and infection kinetics or dynamics will be central to the development of new diagnostics, and access to clinical specimens must be improved to enable effective validation and external quality assessments. Target product profiles for NiV diagnostics should be refined to take into account these outstanding needs. Current diagnostics for Nipah virus (NiV), a WHO priority pathogen endemic to Southeast Asia, include in-house laboratory-based serological and nucleic acid amplification techniques. This review identified a number of remaining diagnostic gaps, including lack of point-of-care testing, difficulties obtaining clinical specimens and limited understanding of viral diversity, infection kinetics or dynamics, and ecology of the wild life reservoir; target product profiles for NiV diagnostics should be refined accordingly. Development of more reliable diagnostics will be key to the prevention and management of NiV disease, and to implementation of a ‘One Health’ approach comprising both human and animal surveillance and intervention. Nipah virus (NiV) infection is an emerging pathogen in Southeast Asia, first detected in the 1998–1999 outbreaks in Malaysia and Singapore, with seasonal outbreaks in Bangladesh and India since 2001, and a suspected 2014 outbreak in the Philippines.1–5 In the 1998–1999 outbreak, nearly 300 human cases with over 100 deaths were reported, and more than a million pigs were euthanised.6 Since 2001, NiV has infected hundreds with an average case fatality rate of 75%.5 Currently, there are no licensed vaccines or therapies, and only supportive treatment is available. NiV has been identified as a high-priority pathogen by WHO due to the broad geographical distribution of the NiV host reservoir and its potential for zoonotic and human transmission, as well as limitations in treatment and prevention.7–9 However, there are few validated and regulated diagnostic tests available for NiV. This landscape analysis provides an overview of the current state of NiV diagnostics for screening, diagnosis and surveillance, highlighting further research and development needs. Geographical distribution of henipavirus (Nipah and Hendra) outbreaks. 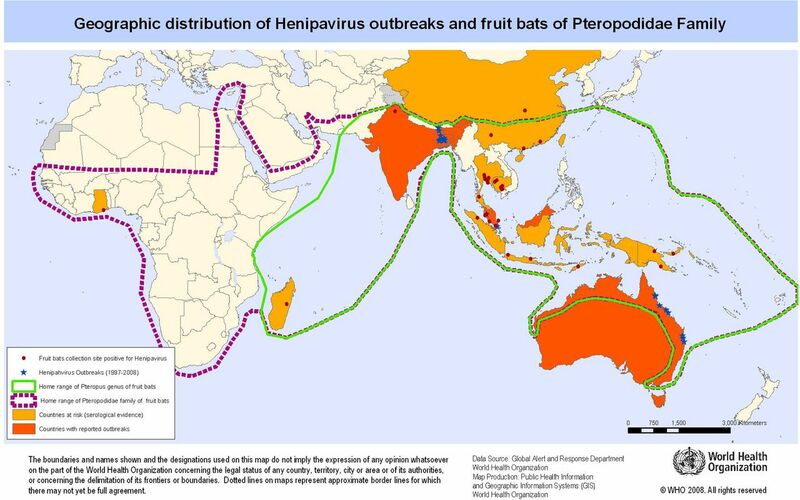 Reprinted from Emergency preparedness and response—Nipah virus infection, WHO, Geographic distribution of henipavirus outbreaks and fruit bats of Pteropodidae family, copyright (2008). At the early stage, NiV infection typically presents as febrile encephalitis or pneumonia, and can be difficult to distinguish from other febrile illnesses. Respiratory distress was a hallmark in approximately 20% of cases in the Malaysia–Singapore outbreak and 70% of cases in Bangladesh–India. Depending on the severity, patients can also present with fever, malaise, headache, myalgia, nausea, vomiting, vertigo and disorientation. The NiV genome consists of a single-stranded negative-sense RNA of approximately 18.2 kb and encodes for six major structural proteins: F, G, nucleocapsid (N), phosphoprotein (P), matrix protein (M) and RNA polymerase (L) and three accessory proteins (V, W and C).12 40 Genetic sequencing has shown that the NiV and HeV coding regions for the N, P, C, V, M, F and G proteins have 70%–90% genetic homology, with approximately 92%, 87%, 83% and 68% amino acid homology for the N, L, G and P proteins, respectively.10 12 40 59 60 Because of this homology, diagnostic tests can be cross-reactive for HeV and NiV, depending on the chosen RNA or antigen targets. Genetic sequencing confirmed that the NiV strains circulating in Bangladesh and India (Clade I, or NiV-B) were different from the strains identified in Malaysia and Singapore (Clade II, or NiV-M),23 45 60–62 with >92% genetic and amino acid homology across NiV-M and NiV-B strains.7 10 44 45 61 63 64 Further analysis confirmed the presence of two distinct NiV-M subclade strains circulating in the north and south, likely arising from distinct hosts.64 65 Lineage diversity needs to be taken into consideration in order to identify strains specific to a particular region, as well as ongoing genetic mutations to assist detection of all circulating strains (including differentiation from HeV). Since the symptoms of NiV infection are similar to other febrile diseases, early diagnosis is critical for containment of an outbreak and to facilitate appropriate patient care. Laboratory testing for NiV includes nucleic acid amplification testing (NAAT, eg, PCR and sequencing), IgG/IgM/antigen ELISA, immunofluorescence assay, histopathology, and virus isolation and neutralisation.50 66 67 Table 1 describes the typical infrastructure, settings and resources required for the various test types. Currently, the majority of international laboratories use in-house NiV assays; however, the degree of test validation varies widely.28 50 67 There are a small number of commercial PCR kits available and only one commercial source for reagents (not an assembled/validated kit) for ELISA testing (tables 2 and 3, and online supplementary table S1). While PCR is recommended as the most sensitive method for diagnosis of active NiV infection, NiV-specific IgM ELISA is an alternative serological approach where PCR is not available.25 Histopathology (immunohistochemistry) is used post mortem to confirm NiV diagnosis in fatal cases, and virus isolation and neutralisation techniques are generally used for confirmation and restricted to BSL-4 facilities with stringent safety precautions. Specifically for animal health, the World Organisation for Animal Health (OIE) has developed the Manual of Diagnostic Tests and Vaccines for Terrestrial Animals to provide internationally agreed diagnostic laboratory methods and requirements for the production and control of vaccines and other biological products, towards the goal of facilitating international trade in animals and animal products and to contribute to the improvement of animal health services worldwide.70 Details of the specific tests and parameters are described in table 2. Serological tests can directly detect NiV antigens, as well as IgM and IgG antibodies raised against NiV antigens. In general, serological tests are less sensitive to minor genetic variation and more broadly cross-reactive within subtypes and strains.45 Antigen and IgM tests can be used to detect active infection; detection of anti-NiV IgM in serum peaks after 9 days of illness (based on hospital admittance) and can persist for at least 3 months. Since IgG can persist long after convalescence, IgG tests are primarily used for epidemiological studies and surveillance; detection of anti-NiV IgG peaks after 17 days of illness and can persist for more than 8 months.76 Existing in-house serological tests for NiV are shown in table 4. IgM ELISA is typically the first-line NiV serological diagnostic test, followed by serum neutralisation or PCR as a confirmatory test.1 50 67 For increased specificity, recombinant proteins, monoclonal or polyclonal antibodies are used as capture agents. Recombinant NiV M protein has been shown to be highly reactive against antibodies in porcine sera.77 Taking advantage of the >90% homology between HeV and NiV N and G proteins but ~30% difference between their P proteins, polyclonal antibodies have been developed to capture both NiV and HeV N antigens,78 79 preferential detection of HeV P antigens,78 and capture of both NiV and HeV G antigens including live virus.80 ELISA combinations of these polyclonal antibodies can enable pan-henipavirus (NiV and HeV) detection, as well as differentiation between NiV and HeV. However, it is difficult to compare assay sensitivity due to differences in sample preparation and units of quantitation (pfu/mL vs infectious units vs TCID50). ELISA test reagents can be translated into a lateral flow format to create a rapid diagnostic test (RDT) that can be implemented in a non-laboratory environment, typically paired with minimal specimen processing (blood, plasma, swabs).81 The lateral flow format enables a faster time to result (10–30 min), although with a lower detection sensitivity than their ELISA counterparts.82 Currently, there are no NiV (or HeV) RDTs available for humans or animals. As the symptoms of NiV infection can mimic other febrile diseases, severe cases are at risk for fatality with misdiagnosis and delayed treatment. A syndromic approach involves testing for pathogens based on a syndrome such as febrile or encephalitic disease; a shift from individual tests to multiplex panels to quickly identify or eliminate likely pathogens from a single specimen. Consideration must be given to the cost of additional reagents and more sophisticated instrumentation; however, a rapid and efficient diagnosis scheme that impacts infection control may be cost-saving overall.87 88 As NiV outbreaks can be both regional and seasonal, region-specific panels may be more cost-effective and can be deployed ‘as needed’ for case detection as well as surveillance of risk factors across patient populations. Multiplex PCR assays have been developed in the laboratory for differential detection of multiple pathogens or clades, using microarray, microcard or microsphere technologies. Microsphere array (Luminex) technology has been developed for detection and differentiation of HeV and NiV isolates.89 These microsphere assays achieved differentiation of HeV and NiV, with the sensitivity of HeV detection comparable with individual qPCR. Multiplex TaqMan array card technology, typically a 384-well microfluidic card for simultaneous PCR reactions, has been developed for differential detection of acute febrile illness, including NiV, as 26-member and 21-member real-time RT-PCR panels.90 91 The clinical performance exhibited an overall 86%–88% sensitivity and 97%–99% specificity compared with the individual real-time PCR assays. The 26-member panel includes 15 viruses, 8 bacteria and 3 protozoa. The 21-pathogen CNS multiple-pathogen assay includes two parasites, six bacterial pathogens and 13 viruses. Microarray technology has been developed for simultaneous interrogation of respiratory and gastrointestinal disease, including as global fever and biothreat agents92 93; such automated platforms enable ‘sample in, result out’ processing, but no panel includes NiV at the present date. The ideal NiV diagnostic test would detect all NiV lineages across all regions with equal sensitivity; however, many of the early PCR tests were developed from Bangladesh–India (NiV-B) or Malaysia–Singapore (NiV-M) strains. Thus, NiV diagnostics could benefit from a consensus-driven pan-NiV probe set. Additionally, further information is needed on viral and immune kinetics of NiV to identify the pathogenesis of NiV in blood and non-blood samples. Understanding the course of NiV infection at different stages of the disease would help to identify the window for effective intervention, and to better monitor transmission and recovery. For diagnostic test developers, clinical specimens are key to the validation process; however, validation for NiV tests has been limited due to the lack of NiV-positive sera available.67 78 While animal samples may be used to investigate the performance characteristics of a test, there is a risk that the antigens found in specific animal-sourced NiV infections are not the same as those found in humans or other animals.78 The WHO International Biological Reference Preparations serve as reference sources for ensuring the reliability of in vitro biological diagnostic procedures and are distributed by the WHO custodian laboratories. As new diagnostic tests are developed, these agencies could perform routine external quality assessment (EQA) monitoring of tests using up-to-date clinical specimen panels and reference standards. This role will be particularly important when test developers have little incentive to seek international regulatory approval. Given the often rural and remote NiV outbreak settings, sensitive and accurate diagnostics for NiV must be deployable under a range of circumstances, particularly at the point of care (POC). Existing POC and ‘near-POC’ NAAT platforms have lower infrastructure requirements than laboratory-based diagnostics, with automated sample preparation resulting in fewer training requirements for healthcare workers and cartridge-based formats allowing tests to be self-contained. They can therefore be more easily implemented in decentralised laboratories or field-based settings.102–104 Given the range of assays already developed for these commercial NAAT platforms, current NiV PCR assays could likely be readily adapted to the POC format. RDTs are ideal for field testing and low infrastructure settings such as the clinic or home.81 RDTs have been developed to effectively screen and triage suspected high-risk cases such as Lassa, Ebola and Dengue.105–107 Similar to Ebola, the pathogenicity of NiV makes specimen processing a challenge in a non-laboratory setting, thus preliminary work in antigen ELISA development78–80 could serve as a starting point for an antigen NiV RDT. Education campaigns may be helpful to increase awareness of the risk for NiV infection in the community and promote appropriate care-seeking behaviour, as well as to maintain vigilance for case identification by healthcare personnel.108–110 Early detection of NiV outbreaks should trigger a coordinated mobilisation of resources for infection control, as well as patient isolation, care and contact tracing. In addition to playing a central role in the recognition and control of outbreaks, diagnostic tests can enable a more nuanced understanding of the window of positivity and duration of infection, transmission risk and risk factors for severity for NiV, one of the most widespread agents of febrile encephalitic disease. In particular, diagnostics to support early detection will be critical for ‘hot spot’ interventions and containment (online supplementary table S2). However, several of the gaps identified in the 2016 WHO R&D Blueprint remain, including a lack of routine EQA, understanding of NiV viral and antibody kinetics, well-characterised and up-to-date proficiency panels, and accurate surveillance data. Target product profiles for NiV should be refined to include the need to identify all known lineages of NiV, and the benefits of RDT POC diagnostics and syndromic panels. As diagnostics are a key element to achieving the goals of the R&D blueprint, WHO is coordinating research and funding through product development partnerships with groups such as FIND to ensure the development, evaluation and delivery of high-quality, affordable diagnostics for NiV. We gratefully acknowledge all those who attended the WHO R&D Blueprint Roadmaps: Consultation on Nipah in March 2018. Editorial assistance for later drafts was provided by Rachel Wright, PhD, funded by FIND, according to Good Publication Practice guidelines (http://annals.org/aim/fullarticle/2424869/good-publication-practice-communicating-company-sponsored-medical-research-gpp3). Publication of this article was funded by FIND.
. Nipah encephalitis—an update. Med J Malaysia 2014;69(Suppl A:1):03–11.
. Update: outbreak of Nipah virus—Malaysia and Singapore, 1999. MMWR Morb Mortal Wkly Rep 1999;48:335–7. , 2018. Nipah Virus (NiV) Infection. http://www.who.int/csr/disease/nipah/en/ (accessed 25 Feb 2018). , 2018. Nipah Virus (NiV). https://www.cdc.gov/vhf/nipah/index.html (accessed 25 Feb 2018). , 2017. R&D Blueprint for action to prevent epidemics. WHO RD Bluepr. http://www.who.int/blueprint/en/ (accessed 12 Sep 2017).
. Henipaviruses: emerging paramyxoviruses associated with fruit bats. Curr Top Microbiol Immunol 2007;315:133–59. , 2018. Nipah Virus Infection factsheet. http://www.who.int/mediacentre/factsheets/fs262/en/ (accessed 25 Jan 2018).
. Species-specific and individual differences in Nipah virus replication in porcine and human airway epithelial cells. J Gen Virol 2016;97:1511–9.
. Henipaviruses in their natural animal hosts. Curr Top Microbiol Immunol 2012;359:105–21.
. Experimental transmission of Nipah virus infection to pigs and cats. In: Nature reviews. 39. Sydney, Australia: Drug Discovery, 1999.
. Characterization of the antiviral and inflammatory responses against Nipah virus in endothelial cells and neurons. Virology 2010;404:78–88.
. Characterization of Nipah virus from outbreaks in Bangladesh, 2008–2010. Emerg Infect Dis 2012;18:248–55. , 2018. Biosafety in Microbiological and Biomedical Laboratories (BMBL) 5th Edition—CDC. https://www.cdc.gov/biosafety/publications/bmbl5/ (accessed 12 Feb 2018). , 2014. Infection prevention and control (IPC) guidance summary. http://www.who.int/csr/disease/ebola/evd-guidance-summary/en/ (accessed 1 Feb 2018). , 2015. Manual of diagnostic tests and vaccines for terrestrial animals. Chapter 2114 Nipah Hendra Virus Dis. http://www.oie.int/fileadmin/Home/eng/Health_standards/tahm/2.01.14_NIPAH_HENDRA.pdf (accessed 25 Feb 2018).
. Kinetics of IgM and IgG seroconversion in Nipah virus infection. Neurol J Southeast Asia 2014;5:23–8.
. Early diagnosis of Lassa fever by reverse transcription-PCR. J Clin Microbiol 1994;32:2898–903. , 2018. BioFire Defense. FilmArray® Test Kits. http://biofiredefense.com/biosurveillance-systems/filmarray-test-kits/ (accessed 17 Sep 2019). , 2015. Emerging viral diseases: the one health connection: workshop Summary. Washington (DC) : National Academies Press (US). http://www.ncbi.nlm.nih.gov/books/NBK280057 (accessed 25 Feb 2018). Contributors LTM contributed to drafting the manuscript and provided background research for the manuscript. CK-C contributed insight into diagnostic needs for outbreak pathogens. All authors reviewed, edited and approved the final version of the manuscript. Funding FIND was funded for this work by UK aid from the UK Government. Disclaimer The opinions expressed in this article are those of the authors and do not necessarily reflect those of the institutions or organisations with which they are affiliated.